Our company offers partial or complete refinishing – traditional style hand-rubbed lacquer finish. Open-pore satin finish is also available as a more economical solution. Our company offers complete or partial rebuilding, as well as reconditioning of your piano, depending on the customer’s preference or budget. Certain touch-up work (moving damage, nicks, chips) or reconditioning of the finish (“french-polishing”) or the interior of your piano can be done in your home. With over 15 years of experience Chulo’s Piano does the highest quality piano restoration and rebuilding in New York. 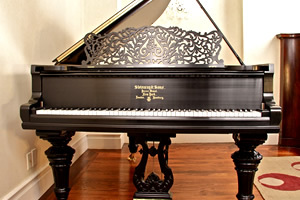 It is a full-service piano restoration company. We do several levels of case restoration, the pinnacle being the perfect hand-rubbed ebony lacquer and closed-pore satin lacquer wood grain finish. This is the showroom finish favored by the famous piano maker Steinway and Sons. 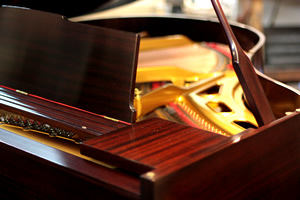 For piano owners with more limited resources, we do open-pore lacquer refinishing on wood-grain pianos, and even finish respraying over the existing black or color base, lightly sanded for color reconditioning. In addition, we do french polishing on both black and wood-grain pianos, as well as touchup work, performed in the customer's home. In other words, Chulo's Piano has a solution to fit any piano or budget, to improve the appearance of your instrument. 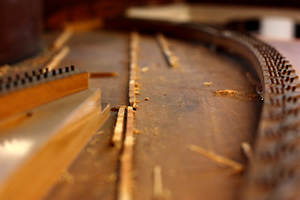 Aside from casework, we do basic rebuilding on most standard pianos, including soundboard repair and pinblock replacement. © 2011 Chulo's Piano Refinishing, all rights reserved.